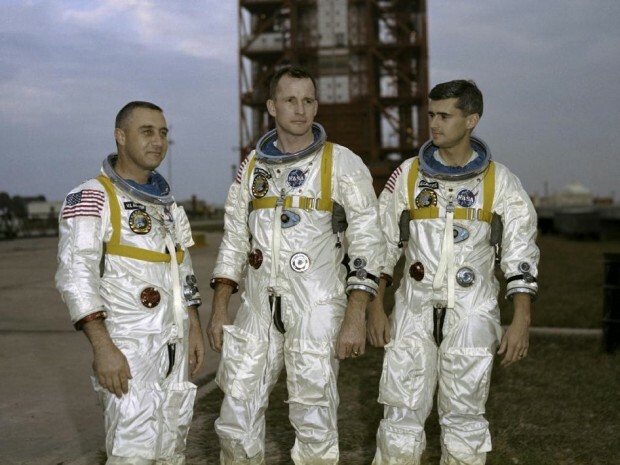 The US National Aeronautics & Space Administration yesterday [Jan. 27] paid tribute to three Apollo 1 astronauts killed 46 years ago in a Cape Canaveral launchpad blaze — two of whom had strong Bermuda ties. Virgil [Gus] Grissom, Roger B. Chaffee and Edward White died when a fire swept through their Apollo 1 capsule during a training mission for America’s manned moon-landing project on January 27, 1967. Apollo 1 had been scheduled to be the first manned mission of the US Apollo manned lunar landing programme, with a target launch date of February 21, 1967. Immediately after the fire, NASA convened an accident review board to determine the cause of the fire. The astronauts’ deaths were attributed to a wide range of lethal design and construction flaws in the early Apollo command module. The manned phase of the project was delayed for 20 months while these problems were corrected. 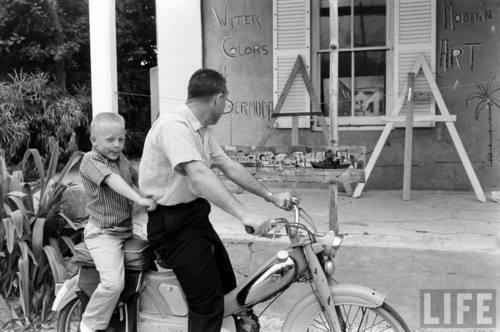 Mr. Grissom, the second American to fly in space and the first US astronaut to go into space twice, had served as John Glenn’s CAPCOM [capsule communicator] from NASA’s Cooper’s Island tracking facility during his historic first orbital mission in 1962. In the early years of the manned space programme, astronauts were dispatched to NASA tracking stations around the world to communicate directly with their orbiting colleagues as CAPCOMS. The space agency believed astronauts were best qualified to understand the situation in the spacecrafts and convey information to the flight crew in the clearest way. Members of the Mercury, Gemini and Apollo space programmes were regular visitors to the Cooper’s Island facility throughout the 1960s; Scott Carpenter, one of the original Mercury Seven astronauts recruited by NASA in 1959 and the second American to orbit the earth in 1963, was permanently grounded by the space agency after suffering an elbow injury in a Bermuda moped accident in 1964. 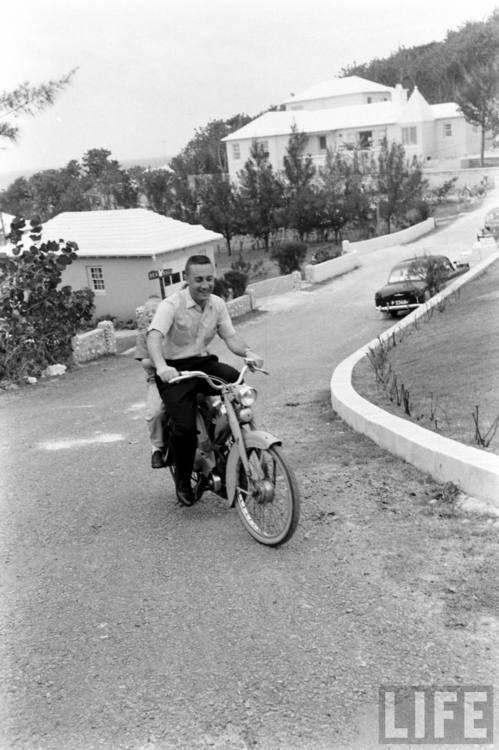 Mr. Grissom became an unofficial tourism ambassador for Bermuda after “Life” assigned a photographer to cover one of his visits to Cooper’s Island; the weekly news magazine published a hugely popular photo spread of the first American to twice slip earth’s surly bonds as he sought to master a Bermuda rental moped. During his March, 1965 Gemini 3 orbital flight with John Young, Mr. Grissom and his colleague shared a spectacular astronauts’-eye view of Bermuda which they attempted to photograph for posterity. “Boy, we really have a beautiful planet,” John Young later told “Life” magazine. “I wish I’d had more time to enjoy it. I said to Gus, ‘Holy smoke, there’s Bermuda. Pitch over and I’ll take a picture of it. Another regular visitor to Cooper’s Island, the high school at the old US Naval Air Station in Bermuda was named for Mr. Chaffee from 1970 until it closed in 1995. The Apollo 1 astronauts remained the only casualties of the US space programme until the shuttle “Challenger” exploded shortly after lift-off on January 28, 1986 — 28 years ago today — killing its seven-man crew. It is great to see NASA continuing to pay tribute to these three space pioneers, 46 years after the tragedy that claimed their lives. The subsequent investigation into the cause of the fire, and the determinations made as to what prevented them from being able to exit the capsule before perishing, ultimately led to improvements in design and safety which contributed to the Apollo programs’ success in landing on the Moon two short years later. 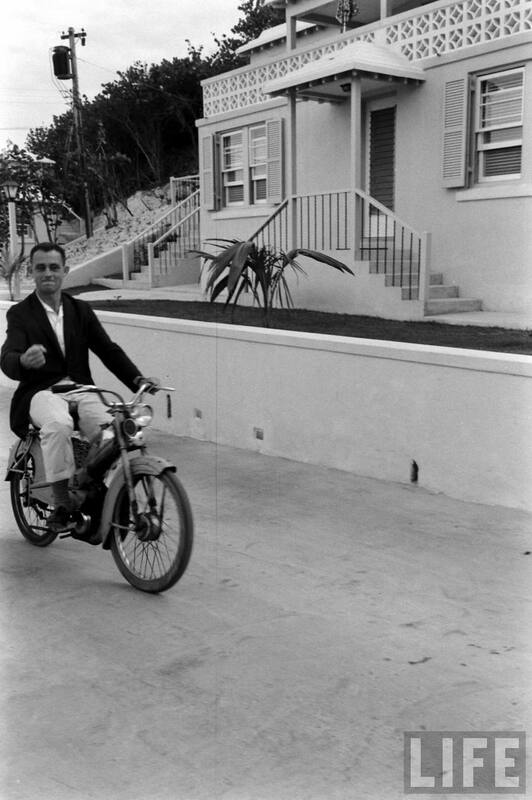 Thanks for sharing the photos of Commander Grissom riding around Bermuda on a Mobylette! nice story…..any guess what the Moby is worth in todays dollars? and what did Bermuda do…went and changed the school named after him to suit themselves.A school that the Americans left behind in good condition and still used to this day.